Abstract Expressionist pioneer Jackson Pollock (1912 – 1956) poured and dripped paint onto canvases, challenging the traditional use of an easel and brush. Deceptively childlike, Pollock’s work was actually astoundingly complex and sophisticated. Compelled by inner turmoil, Pollock used dramatic movement to pour, drip and hurl paint onto huge canvases attached to the floor. Pollock, who was influenced by Picasso, Miró and the Surrealists, expressed subconscious thoughts through his motions, and revolutionized a style of painting in which the work has no identifiable parts or focal point. In October 1945 Pollock married American painter Lee Krasner, and in November they moved to what is now known as the Pollock-Krasner House and Studio in Springs on Long Island, NY. Peggy Guggenheim lent them the down payment for the wood-frame house with a nearby barn that Pollock converted into a studio. There he perfected the technique of working with liquid paint. 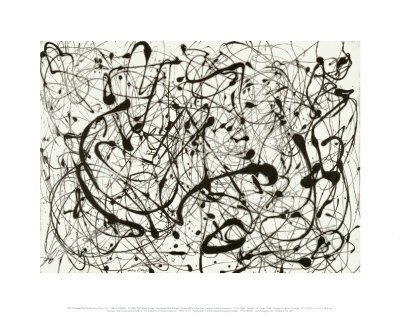 Pollock was introduced to the use of liquid paint in 1936 at an experimental workshop operated in New York City by the Mexican muralist David Alfaro Siqueiros. He later used paint pouring as one of several techniques on canvases of the early 1940s, such as "Male and Female" and "Composition with Pouring I." After his move to Springs, he began painting with his canvases laid out on the studio floor, and he developed what was later called his "drip" technique. 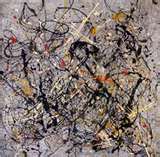 Therefore, Pollock turned to synthetic resin-based paints called alkyd enamels, which, at that time, was a novel medium. Pollock described this use of household paints, instead of artist’s paints, as "a natural growth out of a need." He used hardened brushes, sticks, and even basting syringes as paint applicators. 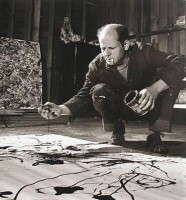 Pollock's technique of pouring and dripping paint is thought to be one of the origins of the term action painting. With this technique, Pollock was able to achieve a more immediate means of creating art, the paint now literally flowing from his chosen tool onto the canvas. By defying the convention of painting on an upright surface, he added a new dimension, literally, by being able to view and apply paint to his canvases from all directions. Silver On Black; Convergence; No. 14 (Gray); Yellow, Grey, Black; One, No. 31; Number 8, 1949; Lucifer; Zeichnung Tropftechnik, Summertime: Number 9A, 1948; No. 32, c.1950; Number 18, 1950; Number 10, 1949; Alchemy, 1947; Mural, c.1943; Number 13A: Arabesque; Number 9, 1949; Number 28; Shimmering Substance, c.1946.